A pedestrian foot bridge over the Siem Reap River in Siem Reap, Cambodia. 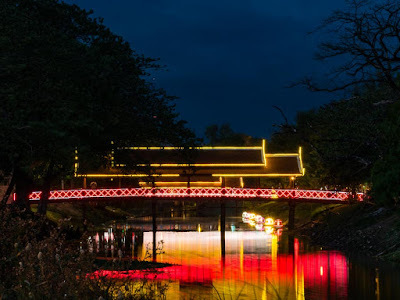 The bridge connects two tourists' nightmarkets. Most rural Cambodian villages don't have enough electricity to burn it on decorative lights. 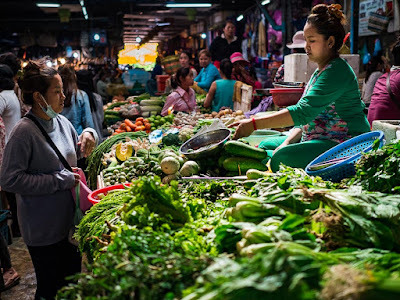 Siem Reap, like Luang Prabang, Laos, is a product of our smaller world; the mass tourism that is swamping parts of Asia. The world famous ancient city of Angkor is just a few kilometers from downtown Siem Reap and a brand new international airport connects Siem Reap to the world. You can literally have breakfast in a hyper modern city like Tokyo or Seoul and dinner in ancient Angkor, a city that at its prime was bigger than London or Paris. A city that was thriving before the European powers had even heard of a place we now call the Americas. "Pub Street" in Siem Reap is the center of the town's nightlife. This is less representative of "real" Cambodia than Broadway is of the United States. 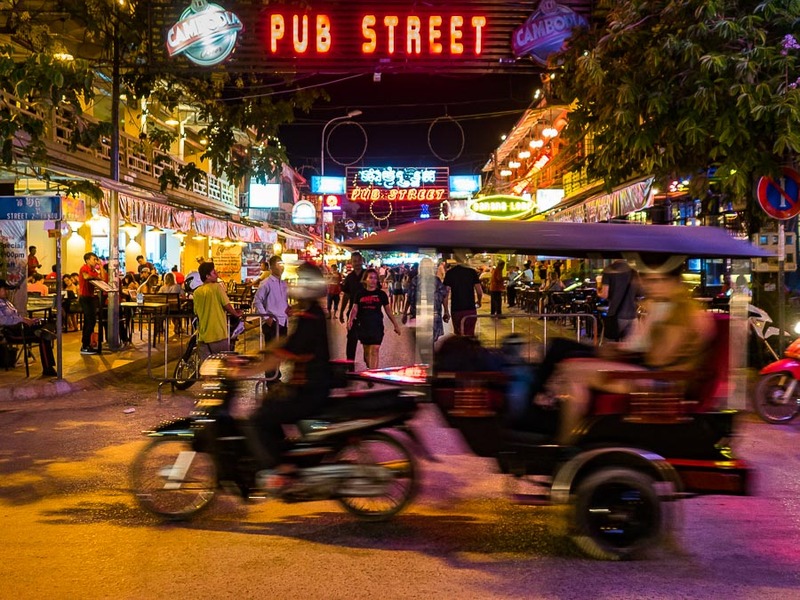 Tourists who visit Siem Reap see a city that has many of the conveniences (but on a much smaller scale) of any modern city, whether it's Bangkok, Chicago or Sydney. An abundance of restaurants and hotels. Air conditioning, paved streets and running water. Widely available wifi and 4g cell service. 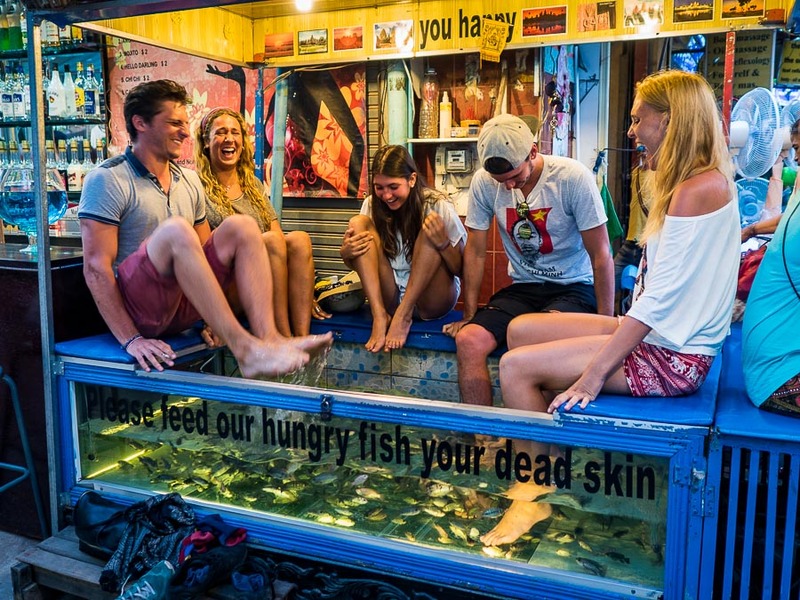 But Siem Reap exists in a tourists' bubble. You don't have to go far out of town, really only a couple of miles, to see Cambodia as it still is. 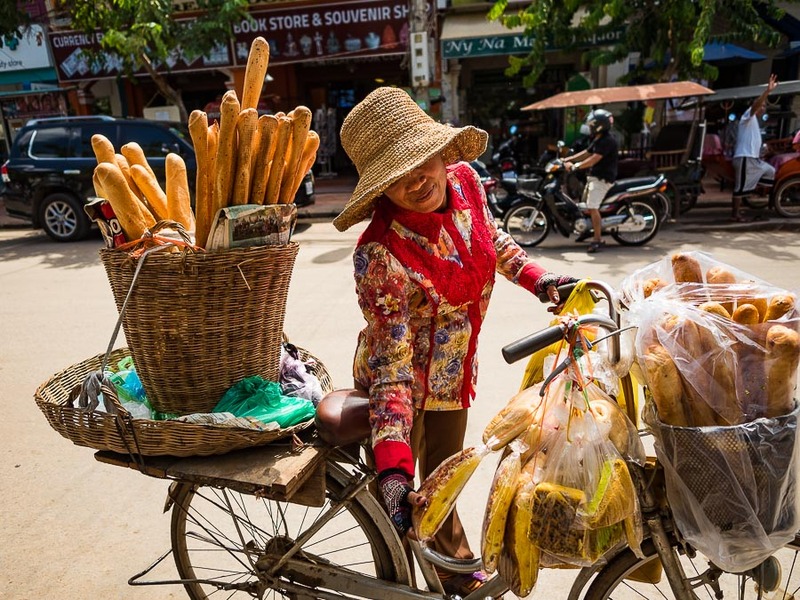 A woman sells baguettes from her bicycle. Excellent bread is one of the legacies of French colonialism. People still use oxen and water buffalo to plow their fields just 10 miles from downtown. Fields that during my first visit 10 years ago, were littered with landmines sown by the Khmer Rouge and unexploded ordinance from almost 20 years of constant warfare. The pavement ends at the main highway, most of the roads into the villages are still dirt or laterite. You don't have to go too far off the paved road to get beyond the reach of Cambodia's nascent electrical grid. And water is from local wells and boreholes (wells and boreholes that are running dry because of the drought). 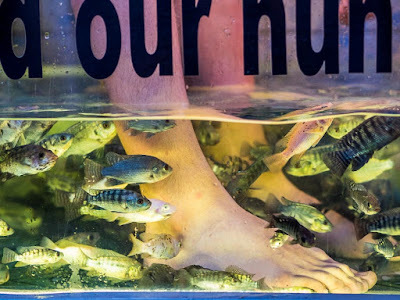 Tourists get "fish massages" in a sidewalk fish tank in Siem Reap town. 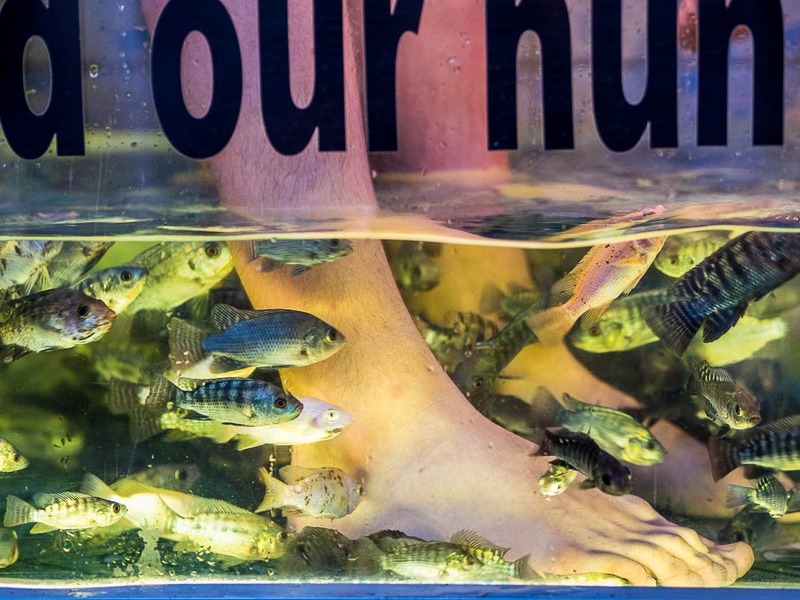 Cambodia is a disconcerting place for me to visit. I'm of a certain age and I remember well the "secret bombing" perpetrated against Cambodia by Richard Nixon and Henry Kissinger. I remember reading about and seeing news reports of the Khmer Rouge atrocities committed against the Cambodian people. I think the "secret bombing" (which was only secret to the American people, the Cambodians knew exactly who bombed them) further radicalized the Khmer Rouge and led directly to the Cambodian genocide. 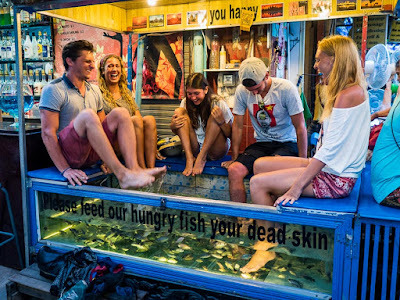 I'm glad the Cambodians in the tourist industry in Siem Reap (and Phnom Penh and tourist centers on the Cambodian coast) are bettering their lives, the challenge is to expand the bubble so all Cambodians benefit. 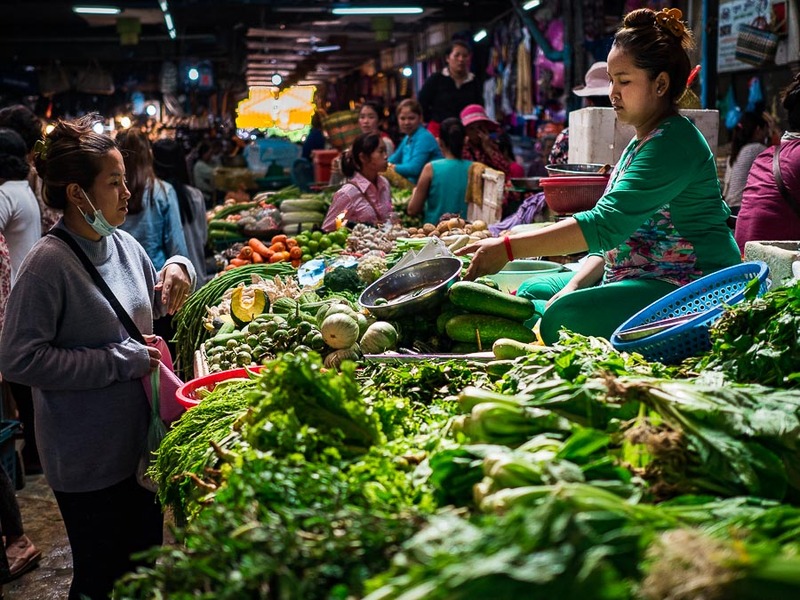 A market in Siem Reap. There are many more photos of Siem Reap in my archive.